The Place Stellar at 1-Altitude in the heart of Raffles Place is one of those restaurants I think of if you are looking for a good dining city view of Singapore with good dishes. The restaurant has a simple interior design, nothing fancy and it doesn’t need to. The main dining area is spacious, and we highly recommend prior reservations to snag that much coveted table beside the window. The Food Helmed by Chef Christopher Millar, we started with some of the new seasonal signatures found in its six-course Constellations menu (S$130++ per person). The Seared Hokkaido Scallop is a great start for sure. Served along with French Belon oysters, morcilla and pancetta puree, I enjoyed this freshness of the ocean combination. Next up was the Three Textures of Carabineros Prawn, one of the most highly prized prawns in the world. The prawn consommé texture is my preferred way of having this fresh seafood, as the rich broth contained the thick essence of this highly coveted prawn. The dish which caught me by surprise this time at Stellar is the Line Caught Dutch Brill. The presentation is an interesting one, where the brill fish was wrapped with paper bark, then simply lightly torched by the staff right before us. Visually, it was already a treat. The fish was simply seasoned with nori salt and garnished with some spring vegetables. The flavours are not complex, but the fresh brill fish was delicious. Aside from the seasonal dishes, we also tried some of the speciality Tajima Wagyu cuts (tri-tip, chuck rib and oyster blade), which are available in both The Antipodes menu and the ala carte three-course menu (set lunch from S$48++ per person). The Wood-Fired Tajima Tri-Tip served with carrot puree and shimeji mushrooms. Tri-tip steak is a cut from the bottom of the sirloin cut, usually leaner and full of flavour. A crowd favourite, the Braised Tajima Chuck Rib was slow-cooked in red wine and the potato cooked in wagyu fat. Very tender meat, with the potato melting in your mouth. Sinfully good. The third meat was prepared sous vide, the Sous Vide Tajima Oyster Blade, with marbling score of 7-8. Served with beetroot hummus, truffle and a side of potato nest. Retaining the beef jus, and enjoyed with the sweet nodes of the beetroot. Finally, if you are having the Constellations Menu, you can look forward to a visual treat for dessert. 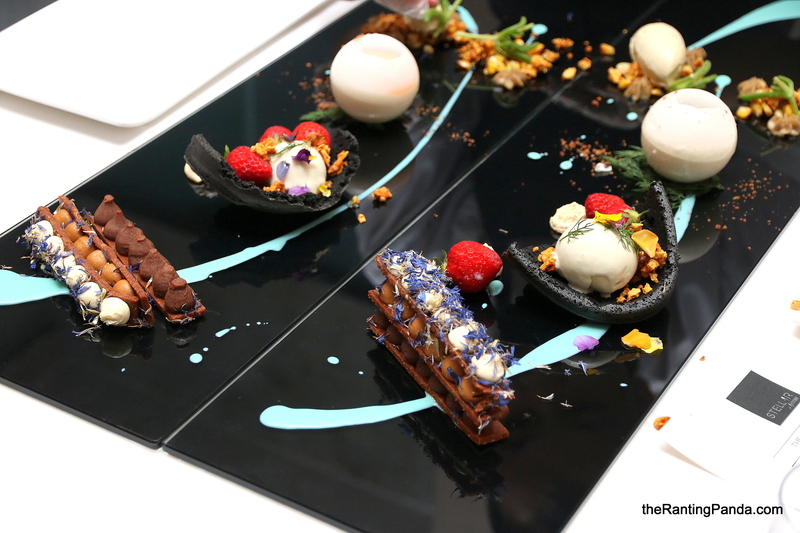 It’s a Dessert Art showcase where the Pastry Chef will prepare five elegantly crafted creations right at your table. I recalled having Yuzu ice cream, chocolate cake and a whole lot of beautiful mess. The colours and presentation were stunning, which I initially thought that the taste would probably not be as good as it looks. But boy was I wrong, as every bite I had was delicious. Rants You need to know you are paying for the view too, which explains the slightly steeper price point. Will I Return Again? This is a place to host your next business meal, or to impress your date. With sweeping view of the Singapore skyline, and the on-point fine dining food on offer here, Stellar at 1-Altitude has much to offer. Make your reservation instantly at Stellar at 1-Altitude here.